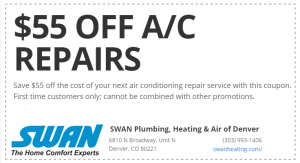 At SWAN Plumbing, Heating, & Air, our expert local service professionals take great pride in providing first-class plumbing, heating, and air conditioning services in and around Arvada, CO. Our industry-certified master plumbers and HVAC pros have nearly half a century of combined experience. With a 100% satisfaction guarantee, our master technicians are the ones to call for all of your home’s plumbing, heating, and air conditioning needs. We are available seven days a week, so give is a call today! Or, click here to schedule your Arvada plumbing or HVAC service online. We are so confident in the work of our Arvada plumbing and HVAC technicians that we proudly back each installation or service call with a 100% satisfaction guarantee. Not only do we provide reliable, same-day service, but we gladly offer up-front pricing for each and every maintenance service, repair, and installation. That’s right. No outrageous per hour billing with us! There are a number of options when it comes to heating your Arvada, CO home, and we provide the expert knowledge and service you need to keep your home warm, cozy, and energy-efficient all winter long. Our heating systems experts will maintain, repair, or replace any furnace, boiler, radiant heating, or ductless split systems for you to keep the inside of your home warm regardless of the outdoor temps. In addition to being EPA and NATE certified, our Arvada furnace repair technicians undergo an extensive drug and background screening process, so you can rest assured only a highly qualified repair expert with long track record of excellence will step foot in your home. Arvada homeowners rely on a dependable furnace to keep them warm during harsh Colorado winters. The best way to ensure that your furnace does not leave you shivering when you need it the most is to schedule an annual tune-up with Swan Plumbing, Heating & Air. Our highly trained and experienced technicians will clean and test the various parts of your furnace, including the thermostat, ignition system, and burner assembly, to make sure that all components of your heating system are functioning properly. If you need the furnace replaced in your Arvada, CO home, look no further than the expert professionals at SWAN Plumbing, Heating & Air. We understand the concerns of customers when it comes to furnace replacement, so we strive to make the entire process as honest and hassle-free as possible. Boiler systems are renowned for their durability and reliability, but they can still run into issues from time to time. Like the plumbing, HVAC, and other systems in your home, your boiler requires regular maintenance in order to run properly and avoid the need for repair. If you find yourself needing boiler repair in Arvada, CO, our expert boiler technicians will have the problem diagnosed and repaired in no time. If a replacement boiler or a boiler installation is needed, the boiler pros at SWAN Plumbing, Heating & Air are standing by to replace your old boiler or install the right new one at an affordable price and ensure your family stays warm for endless winters to come. Hot water heater issues? No problem, because our licensed service professionals handle those too! Do you need quality, affordable plumbing service for your Arvada home? Whether you need a garbage disposal installed or your entire home re-piped, you’ve come to the right place! Our Arvada plumbing team has over 40 years of experience, and we are so confident in their work, we back each project with our industry-leading 100% satisfaction guarantee. From standard routine maintenance to repairs, replacements, and first-time installations, if your Arvada, CO home needs plumbing service of any kind, you can rest assured we have you covered! Our certified Arvada plumbers are some of the best in the industry and ready to resolve any bathroom plumbing issue. We recognize the importance of having a fully functioning bathroom, so we gladly offer same-day service for each and every bathroom plumbing maintenance, repair, replacement, and installation. Whether you have a clogged pipe or are undertaking an entire bathroom remodel, our service pros are ready for the job. Our master Arvada plumbing technicians can tackle any bathroom toilet plumbing project, including any repair, replacement, or installation you may need. We provide fast, expert plumbing work and can quickly resolve any leaking, overflowing, or clogging issues your toilet may be having. Unlike some plumbers, we service and install all major toilet brands, such as Kohler, American Standard, Saniflo, and TOTO. Whether it’s a vessel, center-set, widespread, or wall mount sink faucet and drain, our experienced Arvada plumbers are standing by to help resolve any bathroom plumbing situation. We have years of faucet and drain repair, replacement, and installation experience. From Kohler and Moen to Grohe and Danze, there’s no faucet or drain we can’t handle. Having a properly functioning shower and bathtub is a must, and our professional Arvada plumbers know this all too well! That’s why we offer same-day service for any brand or type of bathtub you have in your home. Regardless of whether you have a Delta, Kohler, Moen, Aquaware, American Standard, Whitehaus, TOTO, or another bathtub and shower brand, our expert Arvada plumbers will have it working like a dream the very same day you call, guaranteed! Our professional Arvada, Colorado plumbers are experts in anything plumbing-related, but kitchen plumbing is truly our expertise. We offer fast, friendly, and reliable fixes to each and every kitchen plumbing hot spot, such as kitchen faucets, waterlines, drains, and garbage disposals. You name it and we can fix it the same day. So, call now for immediate service or to schedule a future visit! From clogged or overflowing garbage disposals to disposals that won’t even turn on, no garbage disposal is an issue for our experienced Arvada plumbers. As with all of our work, we offer a 100% satisfaction guarantee on any garbage disposal repair or installation, regardless of the brand. Kitchen sink faucet and drain issues like overflowing disposals, clogged drains, and leaky faucets are no problem at all for our reliable Arvada, CO plumbers. All kitchen drain and faucet work on all brands, including Whirlpool, KitchenAid, GE, Frigidaire, and Kohler, are also backed by our industry-leading satisfaction guarantee. For only $99 (reg. price $199) we will send one of our clean cut, highly trained & qualified, drain cleaning technicians to your home in Arvada, Colorado and fix any issues you may be facing with drains or sewer line right the 1st time! We offer a full range of drain / sewer line cleaning, drain snake & sewer scope services for all residential Arvada plumbing customers. Do you have air conditioning problems in your Arvada, CO home? Our industry-certified Arvada air conditioning technicians are always available around the clock day in and day out to quickly repair your air conditioner, replace it, or arrange a brand new installation. At SWAN Plumbing, Heating & Air, we pride ourselves on being able to fix any plumbing, heating, or air conditioning problem. 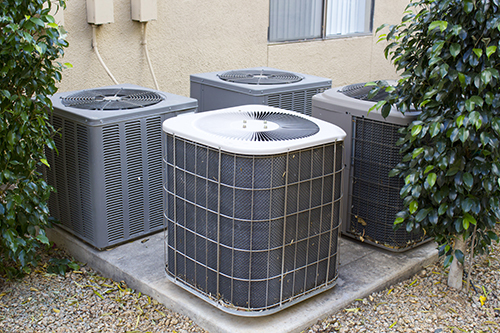 Whether it’s a stalling compressor or shorted circuit breaker, we will get your air conditioner repaired right and ready to keep you cool all summer long. The thought of experiencing an Arvada summer without an air conditioner is certainly not a pleasant one. SWAN Plumbing, Heating & Air provides full air conditioner replacement and installation services to ensure that thought doesn’t become a reality. Our professional Arvada air conditioning technicians will make sure you can always escape the summer heat in your home!